The sponsor was Nabisco. Rusty ate the Shredded Wheat while Rinty ate the Milk Bone dog biscuits. Neither one of these is a Nabisco product anymore. My favorite as a kid (However improbable it mightta been)...1930 hrs Friday Nights on, IIRC, ABC...My dad would use it (or the threat or losing it) as a punishment...YO RINTY!!! 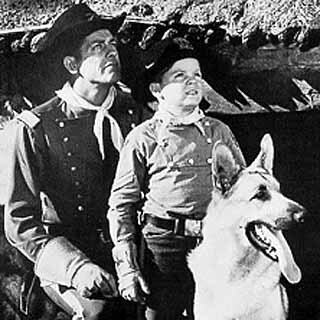 Antenna TV still reruns"the Adventures Of Rin Tin Tin"tv show..saturday and sunday evenings. I grew up with Rin Tin Tin. Always raced home to watch after school TV. Clips sure bring back old memories.